The ancestor of modern kava (piper wichmanii - wild kava) was domesticated by the ancient Pacific islanders around 3000 years ago. Unlike piper wichmanii, piper methysticum (i.e. modern kava) is a sterile plant that can only be reproduced with human effort (by propagation from stem cuttings). Modern kava is therefore a remarkable result of centuries of rational and skillful selection of kava mutations undertaken by growers eager to preserve the most desirable characteristics and minimise any potential negative effects of their plant. At the same time, some of the old cultivars (and the wild ancestor of kava) can still be found on some of the islands. They have not been traditionally consumed due to their higher potential for causing adverse reactions (for example: higher risk of nausea, next day hangover and lethargy) and less pleasant psychoactive effects. These undesirable cultivars are known as "non-noble" or "two-day"/"tudei" (so named because they produce undesirable effects that last for two days). 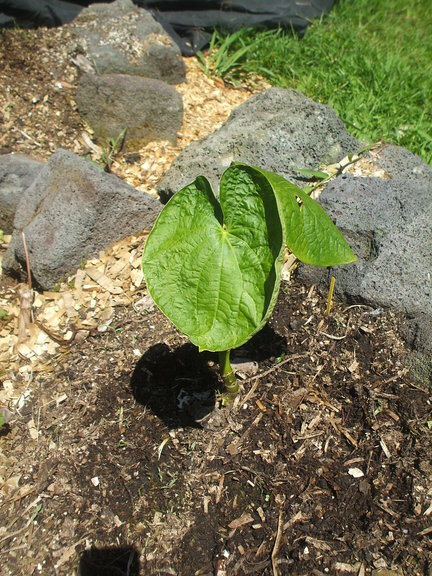 By contrast, the highly desirable kava varieties that have been traditionally consumed on a daily basis are known as "noble" kava cultivars. According to Vanuatu's legislation (Kava Act 2002) only noble cultivars can be legally exported from the islands in order to protect the country's kava's reputation. Noble kavas have desirable compositions of kavalactones (chemotypes) that produce pleasant and beneficial effects. At the same time they also have very low concentrations of other compounds that may cause adverse side-effects. As noted by Dr Lebot and Dr Teschke only varieties considered as Noble have a "good reputation of safe use in Pacific Islands countries". Such strains "have a long tradition of safe use" and have been "consumed on a daily basis without apparent adverse effects when used in normal quantities". By contrast, tudei kavas have undesirable chemotypes and high concentrations of compounds that could potentially produce adverse reactions. According to Dr Sarris, Dr Lebot and Dr Teschke, while medicinal varieties have "a long and proven history of beneficial properties amongst traditional Pacific herbalists", they are not recommended for recreational or frequent use. In fact, it has been suspected that the usage of tudei kavas in the production of certain dietary supplements sold in the West might have been one of the causes behind some of the adverse health effects associated with their prolonged use. According to Dr Teschke and Dr Lebot there is "a well established poor reputation of the non-drink Two-Day varieties". Many scientists recognise regular consumption of Tudei kavas (as opposed to Noble varieties) as likely to cause adverse reactions and hence recommend against their consumption. Tudei varieties tend to have very heavy and long-lasting effects and sometimes feel extra "potent" (albeit they are also much more likely to cause nausea, "kava hangovers", next day lethargy/tiredness, skin problems and other unpleasant side-effects than noble kavas). People unfamiliar with kava chemotypes or the complexity of various kava experiences can easily be impressed by the deep "kick" they can get from tudei-type kavas (even though the nausea and "hangovers" associated with tudei can make them eventually give up kava). Similarly, many vendors demand "strong" kavas from their suppliers as they feel that these "strong" powders are more likely to win their customers hearts and wallets. Sometimes, they may genuinely believe they simply get potent noble varieties with extra sedating qualities. Sometimes though they might perhaps be aware that their "noble" kavas are spiked with tudei, but as they lack access to good, potent and purely noble kavas, they choose to turn a blind eye on this reality in order to stay in business. Tudei kavas generally grow faster and offer higher yields, which makes them very attractive to those farming for export. It takes as long as 4-5 years for Noble kavas to mature enough to be good for consumption, Tudei kavas need much less time to gain "potency". What is more, back in the 1990s Vanuatu farmers were actually contracted to grow tudei kavas for various pharmaceutical companies. As observed by the Kava Library, "a few years later, the market for tudei kava suddenly disappeared and the farmers were stuck with fields of tudei. Rather than take a huge financial loss, they started blending it with their noble Kava and are still doing that to this day. It is noteworthy that the farmers themselves do not drink Tudei but [some of them] are happy to sell it"
Another problem is the use of unsuitable and potentially harmful aerial parts of (noble or non-noble) kava plants. Unlike the roots, the aerial parts of the kava plant (stalks, leaves, stems) contain a toxic alkaloid (pipermethystine) and only tiny amounts of kavalactones. As such they are considered undrinkable, have never been traditionall consumed and their sale for human consumption is actually technically illegal in a number of jurisdictions (including New Zealand). Unfortunately, some farmers and distributors have been mixing these unsuitable parts with kava roots in order to lower their costs and to increase the volumes of their exports. Similarly, some farmers do not clean or dry their kava properly in order to keep its weight higher. For the same reason some vendors have been mixing their powders with such things as flour, sawdust or event cement! Unfortunately, with the current kava shortages such practices are becoming increasingly common. These are yet more reasons to only consume kava from trustworthy sources. Kava Testing: Determining Kava's Nobility, Quality and Purity. The practice of labelling adulterated kavas as "pure", "A Grade", or "100% Noble Roots Only" seems worryingly widespread. As the potential dangers and unpleasant side-effects of drinking such mixes become more evident and better understood, several dedicated kava consumers and kava scientists have been working hard to come up with methods for conducting simple and inexpensive tests that would help to determine particular kava batches' purity and nobility. One such method is the so-called "Acetone Test", i.e. a simple solvent test developed by Dr Vincent Lebot to test whether your Kava is a 'Noble' or 'Tudei' type of Kava with a relatively high degree of reliability. Dr Lebot noted that noble kava and tudei kava each show a statistical distribution of visible wavelengths. When mixed with a solvent (acetone), on average nobles appear yellow, and tudeis appear orange to the eye. The accuracy can be improved by measuring the spectrum with a spectrophotometer, instead of just one's naked eye. Furthermore, as suggested by one testing manual, for best accuracy tests should be performed using known samples of the noble and two day kava cultivars that are common to a specific area. In cases where an alleged noble sample tests as two day, positive identification of the specific cultivar should be verified by an expert. Initially, it was assumed that kavas were either tudei or Noble. And the simple testing method was indeed likely to demonstrate the difference between pure Nobles and pure Tudeis with a high degree of accuracy. With time, some of the testers realised that the real issue is adulteration of Noble kavas with various amounts of Tudei. And in order to determine adulteration (as opposed to pure Tudei) more refined testing standards needed to be applied. These have been developed by a kava researcher and testing expert Garry Stoner (the founder of the True Kava group which regularly monitors kava quality, posts kava test results and publishes a list of certified kava vendors). His improved testing methodology has become widely accepted as one of the most reliable of the currently available ways of determining tudei (and aerial parts) adulteration. The results of new tests have caused a great deal of concern to many of the regular kava drinkers. A significant proportion the tested kavas has turned out to be containing tudei varieties and/or even mixed with the aerial parts of the plant. It appears that that many of the kavas sold online (and probably even a higher proportion of those "no label" kavas sold at dairies or in health stores) likely contain non-noble cultivars and/or aerial parts of the plant. A test performed on the kava plant leaves. The green color indicates the presence of chlorophyll that can only be found in the poisonous, aerial parts of the plant. It can be detected when even small amounts of the plant's aerial parts have been mixed with the roots. While testing methodology is still under research and even more accurate methods (such as measuring flavokavain levels directly using HPLC or HPTLC to confirm tudei presence if the acetone test results appear controversial in light of other data) may become more accessible and routinely used in the future , the currently available techniques have proven to provide convenient, useful and highly reliable screening tools for detecting tudei kava presence. It has been acknowledged by industry experts and scientists that routine testing can dramatically improved the quality and consistency of tested kava products, both when it comes to their nobility, but also the presence of other adulterants, such as the aerial parts of the plant. The presence of aerial parts can generally be detected if kava samples contain significant amounts of chlorophyll (detectable with a spectrometer). Kava powders with significant concentrations of aerial parts will also be much weaker (and often suspiciously cheaper) than pure root powders. Even though it is still unclear exactly how harmful tudei kavas are (and it is possible that they are not necessarily more dangerous than alcohol or popular painkillers), they are certainly known for having less desirable effects than noble kava and can be considered as unstuiable for regular consumption. Similarily, while the exact risk of consuming kavas containing aerial parts of the plant is not yet established, their potentially harmful (or at the very least undersirable) effects are not disputed and both traditional and modern guidelines unequivically warn against their consumption. It is even more clear that moulded or otherwise contaminated kava is not only unpleasant but that it can present a health risk. In light of the above factors, kava enthusiast should try to avoid buying kava from uncertain sources and should pay more attention to the issues of kava purity and truth in advertising.